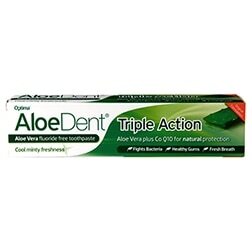 Aloe Dent Triple Action Aloe Vera Toothpaste with Co Q10 is rated 4.8 out of 5 by 62. Rated 5 out of 5 by Charlie Doorbell from For those who prefer fluoride free My teeth and gums are really in good condition after several years of brushing with this toothpaste. Rated 5 out of 5 by Kopasz from Great I have used this producte since 5 years, and I am satisfied. Rated 5 out of 5 by RobJ55 from Fresh, clean taste I love the fresh clean taste of this toothpastte and of course the fact that it is flouride free. 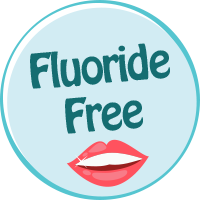 It has all the necessary ingredients to maintain excellent oral hygeine without the toxic content of supermarket toothpaste. A little more expensive but you get what you pay for and is usually available with discount from H & B. H & B delivery service is excellent too.